Nirmalya Trust has diligently been working towards its major focus area i.e. empowering challenged persons through employment! Since we started in 2005, we’ve placed several hearing impaired boys and girls in some of the best hotels in Pune and outside. In 2006, convincing the parents of the hearing impaired was a major task. They refused to let their sons work in the hospitality sector. It was below their dignity. No amount of counseling worked. Finally we convinced them by visiting their villages, counseling in groups, bringing them to Pune and showing them the actual work areas within the hotels. Today the situation is quite the opposite! We get calls from parents saying they’d like to have their ward work in a hotel. The boys are happy too! Along with the pay, PF, and insurance, the candidates get fresh food and snacks. This keeps them healthy and the busy schedule keeps them positively occupied. The change is clearly visible. They are better groomed and better disciplined. They’ve learnt to save and send money back home too. Candidates approach us from remote villages from all over Maharashtra. They have no place to stay when they come to Pune. Nirmalya Trust provides short term living and food facilities at Baner. We train and counsel them before placing them. We help them to relocate, find accommodation when their placement is confirmed. Till today, 71 hearing impaired boys have been placed in the hospitality sector, in the housekeeping, laundry, kitchen and store areas. At Lemon Tree Hotel, Pune and Costa Coffee outlets, our boys are communicating directly with the clients. 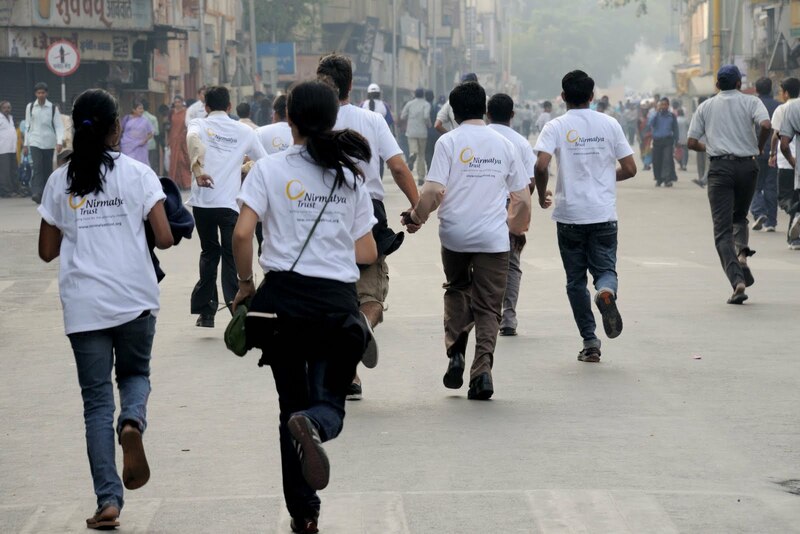 Nirmalya Trust is grateful to all these organizations for having faith in their abilities. On May 28, 2011, Nirmalya Trust handed over two two-wheelers fitted with side-wheels to Amruta Nalawade and Sucheta Mahalle, both paraplegics. A video documentary on Nirmalya Trust was recently aired on the DD Sahayadri TV Channel. Here is the YouTube link. Nirmalya Trust proudly hosted Mr. Philippe Riebere, an internationally renowned professional rock climber from France, at its premises on 26th January 2011. What made this event even more memorable was the fact that Phillip is not an ordinary climber. Philippe was born with a polyhandicap which has various malformations, namely, Rubenstein syndrome. He took to rock climbing and has ever since been a part of the parasports scene all over the world. His work for the recognition of the handicapped in society is a personal therapy which enables him not to pay attention to his difference too much. His organization Handigrimp organizes sports events for challenged persons all over the world. This platform is used to integrate the normal with the challenged. In December 2010 he was a representative organizer of the first ever paraclimbing World Cup in Japan. He has been travelling for 11 years now. He visits different countries to understand the lives of challenged persons in different cultures. In this sense, Philippe is not just ‘not ordinary’, he is amazingly extraordinary! The event started with a short audio-visual session hosted by Philippe wherein a short film was screened. This film described Philippe’s journey and transformation through the years. The session was then open for any questions the audience might have. This was followed by a rock climbing demo on an artificial climbing wall constructed for this event. Physically challenged persons and all visitors got a chance to try out climbing on this wall under the guidance of Philippe. This was very well received by all; youngsters as well as adults present there were equally enthusiastic and enjoyed the climbing experience. Amongst those present at the function were young students and children from various charitable organizations. One special group was that of children affected with HIV from the Suryodaya Foundation. Physically challenged persons from Nirmalya Trust which included the visually impaired, hearing impaired, paraplegic, spastic and orthopaedically challenged, also grabbed this opportunity and successfully made it to the top of the wall. Watching them achieve this was highly inspiring and motivating. Another interesting factor was that, Philippe, in some way or the other, disabled few 'normal' persons who wished to climb the wall and then asked them to climb. For instance, one of their legs was tied or they were blindfolded. Normal persons put themselves in the shoes of the challenged to get a real feel of their experience. It was amazing to see how each of us has it in us to overcome seemingly insurmountable difficulties and eventually reach the top! Philippe had to leave and start back to Mumbai. Before he left however, he had several fans waiting to get his autograph! Philippe's story is one of hard work, endurance, and persistence in the face of difficulties. It is a story that can inspire people from all walks of life, just as it inspired all of us! On 13th January 2011, Nirmalya Trust handed the keys of two scooters with side-wheels to paraplegic candidates Hasan Mujawar and Subhash Sutar. A large contribution for these scooters came from Dr. Aruna and Dr. Ravi Mene. Over the course of 2010 they raised funds for this project through the sale of greeting cards and calendars specifically designed and printed for this purpose. Mr. Mene, an excellent wildlife photographer, contributed his pictures to the stationary that was sold; Mrs. Mene personally made cards with patchwork designs using cloth. These articles were sold to raise funds at events in the UK where the Mr. and Mrs. Mene reside. These two sparkling new Hero Honda Pleasure scooters will give both these working candidates the freedom of movement they so need in their day-to-day life. The charity run organized by Nirmalya Trust on 5th December 2010 was a huge success. 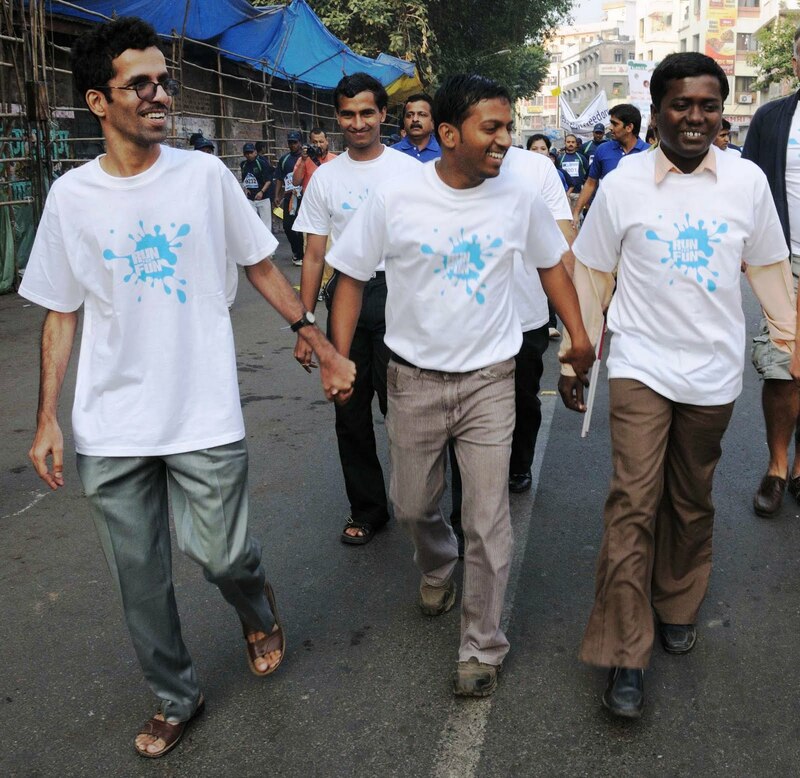 Over 200 t-shirts printed for this event were sold at various locations to raise funds for the NGOs work. Apart from fund raising, the event served as a wonderful platform for several new supporters of the trust, young and old alike, to interact and participate with the physically challenged. 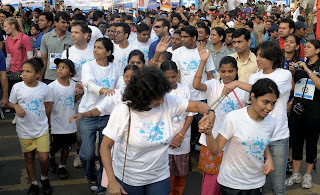 The differently-abled candidates of the trust, along with volunteers and supporters, covered a total distance of 2 kms on the day of the race. Using the buddy-system, each candidate was accompanied by one or more volunteers. It was rather interesting to see some of the visually impaired RUNNING in certain sections. Other serious runners, who had supported the event by purchasing our t-shirts, were seen among the crowd assembled on race day. If you wish to have one of our eco-friendly 100% organic cotton shirts, please write to us at info@nirmalyatrust.org. You buy a t-shirt at a donation price of Rs.1000/- only. Then we all get together on the day of the run, and we RUN for FUN! If you want a certificate in any category, feel free to register yourself. For details, log on to http://www.marathonpune.com/ . PLEASE GIVE US YOUR CONFIRMATION OF PARTICIPATION AS SOON AS POSSIBLE; visit our office on Bhandarkar Road. This'll give us enough time to get the t-shirts printed. In case you're not interested in donating, you're still welcome to purchase just the t-shirt at its regular price and join us for the run. We'd love to have you join us! In case you don't want to run, you can join us and accompany one of our physically challenged persons as far as she/he can go. It'll be great motivation for them. For more information on Nirmalya Trust, see http://www.nirmalyatrust.org/. Nirmalya Trust recently celebrated its annual get-together.Every year this is a day for fun for all the differently-abled persons who are a part of Nirmalya Trust.Students sponsored by Nirmalya, candidates working at Sunkisd Plant Nursery and Taruvar (paper bag unit), the two vocational training centres run by Nirmalya, as well as others who have been placed in various jobs by the Trust come together, catch up and relax.The Visually Impaired, Hearing Impaired, Spastic and others all interacted with each other.In a unique way, the Hearing Impaired and the Visually Impaired played 'musical chairs' together; their companionship was reflective of their comfort level. This year (on August 7, 2010) Nirmalya presented 2 Activa scooters fitted with invalid carriages (side-wheels) to 2 paraplegic candidates - Shekhar Mahandule, a D.Ed student and Ramesh Hadavale, a caretaker in a school. This initiative was taken up 4 years back.On observing the biggest hurdle for a paraplegic, mobility, Mrs. Meena Bedarkar, the founder of the Trust, set the wheels in motion (literally!). The Trust chose those candidates who would put the vehicle to good use as well as maintain them. Dilip Kale, the first person to receive the two-wheeler taught typing to students in his village.His income was barely Rs.1500/- per month.Today, because of the two-wheeler he is able to commute wherever he pleases.He now works as an LIC agent.Mobility has brought stability, self sustainability and dignity. Sunita Walekar and Nilesh Khodaskar also have similar tales of comfort. There are many others who are waiting for Nirmalya to help them. Nirmalya depends on support of society. Each vehicle costs Rs. 60,000/- with side-wheels, registration, helmet, transportation, other fittings and accessories. Hasan, a diploma holder in I.T. (with distinction) is our next candidate. His parents are day labourers at construction sites.They have educated all their four children well.Unfortunately Hasan lost his older brother (his educational support) in a road accident.After a gap and inspite of a traumatic year of sorrow and acceptance, Hasan passed his exams with distinction.He wants to pursue his studies but financial restrains have forced him to work. A young boy in his twenties struggling with such determination deserves our support. Let us all get together to help a cause which will uplift those who literally crawl if not given support! 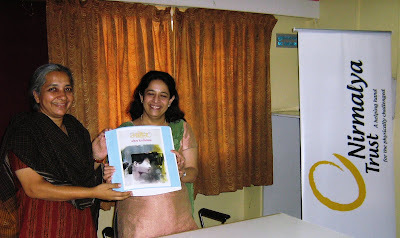 At a press conference at Patrakar Bhavan, Pune on Monday 22nd March 2010, Nirmalya Trust launched the 1st edition of the Braille version of 'Maher'. Maher is a Marathi monthly magazine known for its quality reading material. The monthly issues and especially the Diwali edition is the first choice of the Marathi reading population all over the world. 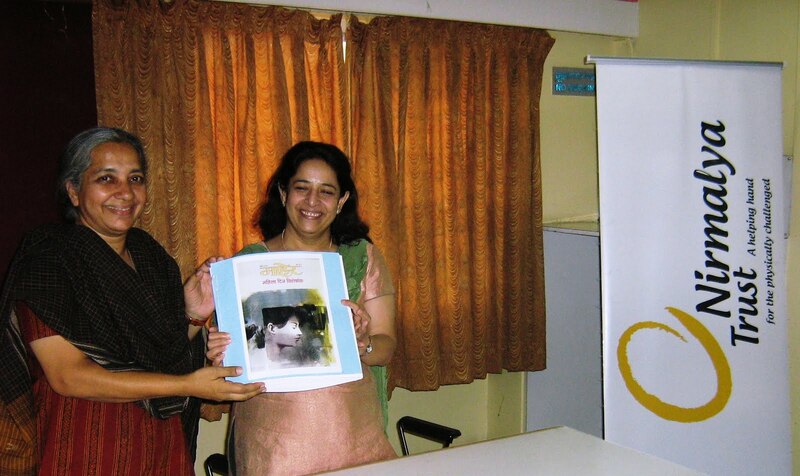 Mrs. Meena Bedarkar, founder and managing trustee of Nirmalya Trust, handed over the first Braille copy of the Maher March 2010 “womens day special” issue to Mrs. Swati Chitnis, owner of Menaka Prakashan. With the total cooperation of Mrs. Swati Chitnis, the visually impaired will now have access to this rich heritage every month. The cost of printing the magazine in Braille is approximately Rs.360/- per issue. However, Nirmalya Trust will print the Braille version every month and make it available to all interested persons/institutions, absolutely free of cost. To make this distribution possible, Nirmalya Trust is looking towards society for financial support. At the press conference, Mrs. Swati Chitnis announced that soft-copies of books published by Menaka Prakashan over the years will also be made available to Nirmalya Trust for transcription into Braille. The visually impaired will now have access to expert advice on health and fitness given by renowned physician Dr. H. V. Sardesai. Nirmalya Trust, an NGO working for the welfare of the physically challenged has made this possible by transcribing Dr. Sardesai’s books into Braille. 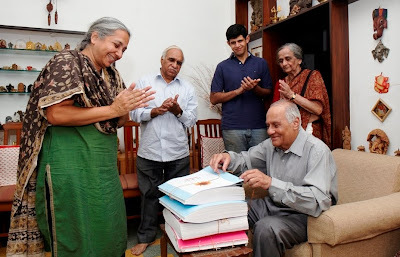 In a small and informal function, 3 books – “Aarogyachi Watchal”, “Aarogya – Samasya aani Upchaar”, and “Aarogya aani Jeevanshaili” were released by Dr. Sardesai at his residence on Thursday 18th March 2010 evening. Mrs. Meena Bedarkar, Managing Trustee Nirmalya Trust and Mr. Joshi of Utkarsh Publications were present at the time of the release. Dr. Sardesai received a demo of the Electronic Braille Reader from a visually impaired candidate of Nirmalya Trust.